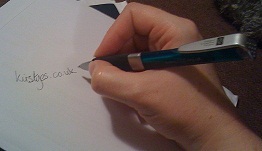 Fancy a writing challenge – why not enter Eurofiction at www.slingink.com. Entry costs £12 for 7 rounds – slingink members only (site free to join). All visitors to the blog can read my found poetry – please do have a go yourselves – it’s poetry made easy and you get to doodle at the same time. Subscribers can read my short story Comeralot – an Arthurian spoof that won Slingink’s Inspirations competition in Spring 2005. My name is Kirsty and I like to consider myself an author, although I do have a day job! I don’t get time to write as much as I’d like but I’m trying to develop better writing habits – any suggestions that don’t include getting up early in the morning and mean that I still get enough sleep are welcome. I dabble in most genres of writing and I am an Open Univeristy Alumni – having just completed my BA (Hons) Literature (I studied both Literature and Creative Writing). I’ve been a bit greedy really as I already have a BSc (Hons) and PG cert and I am going to be starting a Ph.D soon. I love learning really. So if you are a writer, reader, publisher or just plain curious please sign up.